If you're in charge of a rental property, you probably know that there are laws regarding tenant evictions. The laws can vary from state to state, however. In Wisconsin, landlords have the legal right to evict tenants as long as they provide sufficient notice of eviction. Wisconsin winters can be cold, so some private written lease agreements will state that the landlord can't evict during the winter months. Once the landlord is ready to evict, a legal claim must be filed in the local county court. If you're thinking about forcing eviction by cutting off utilities during the winter months, it's important to know that you could face civil penalties. Since real estate laws frequently change, you should not use this information as a substitute for legal advice. Seek advice through an attorney licensed to practice law in your jurisdiction. Landlords in Wisconsin can enter into oral lease agreements with their tenants if the lease term is for one year or less. 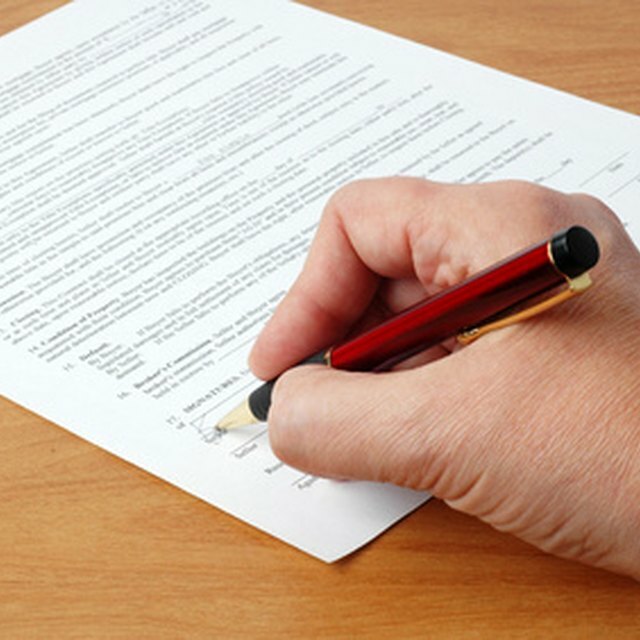 Landlords need written lease agreements, however, for tenancies exceeding a one-year term. Wisconsin requires landlords to provide notice prior to evicting a tenant regardless of whether the lease agreement is oral or written. In Wisconsin, landlords may evict tenants during any time of the year, including during the winter months. Landlords must, however, provide written notice to the tenant providing an adequate notice period prior to filing a summons and complaint in the county clerk’s office. After providing the tenant with written notice, serving the tenant with a complaint and summons and receiving a judgment in the landlord’s favor, the landlord can proceed with eviction through the local sheriff’s office. Landlords must provide written notice to tenants to pay rent or face legal eviction if the tenant is not paying monthly rent obligations. Tenants have five days to pay rent after receiving written notice of eviction. If the tenant pays the entire delinquency within the five-day window, then the tenants can legally remain in the rental. Tenants who continue to live in the unit without paying the delinquency are “holdover” tenants that face legal eviction. Tenants in Wisconsin who do not voluntarily leave the rental premises for nonpayment of rent or for breaching another lease provision face forced evictions. Landlords must file a summons and complaint in the local county clerk’s office setting a date for the eviction hearing. The landlord must serve the complaint and summons personally on the tenant through a process server or sheriff’s office. If the judge rules in the landlord’s favor after the hearing or if, after the tenant does not appear, the complaint is dismissed in the landlord’s favor, then the county sheriff can remove the tenant’s personal possessions and forcefully evict the tenant. Public landlords renting to elderly residents or landlords who enter into lease agreements with local housing agencies such as the U.S. Department of Housing and Urban Development agency may have different lease obligations that prevent landlords from evicting tenants during the winter. The terms of those lease agreements determine, however, whether landlords can evict during certain months.